✾ By using your Facebook insights to help you build a fanbase that starts to interact with you because they enjoy what you’re sharing and can identify with you and your thoughts about what you do in your business and what you enjoy sharing with them. You’ll have fun with your Facebook business as you discover what your insights can offer you! And when those stats drop? I know I’d better get back to it. Checking insights and posting consistently. AND…Making sure I’m posting what my fans want from me. This is where the most important daily pieces of your own Facebook information is located. 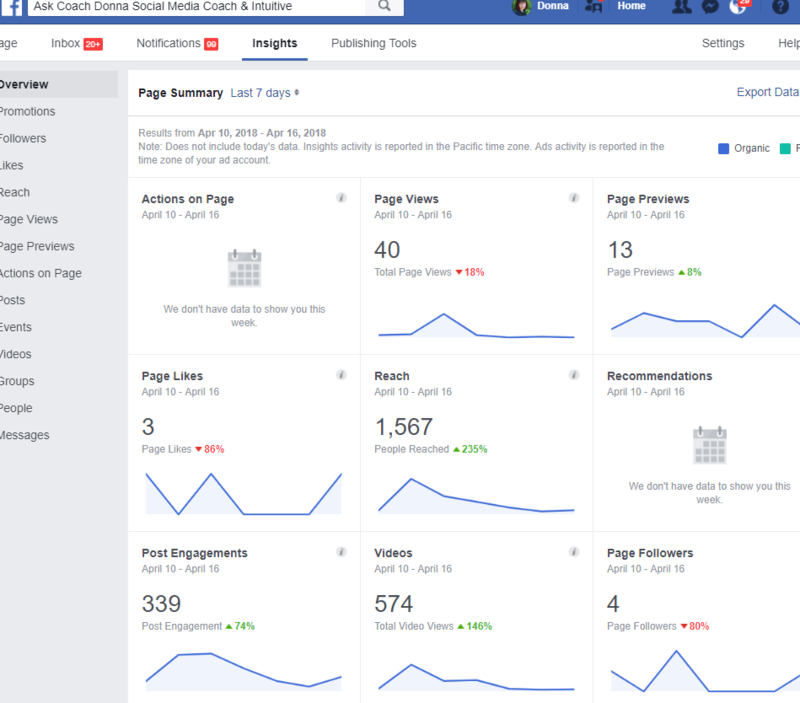 I am confident that you can learn how to analyze your Facebook business insights. You’ll discover what content you’ll want to repurpose because they’re popular with your audience and do more of those types of posts and videos. My first goal for users is to grow their reach with the fans they have. This, of course, is assuming they know their niche audience’s needs and wants, right? Your goal to be a whopping 10% reach of your fans for your Facebook business. And very close to that 10% on your post engagement! → Increasing your reach means more fans are seeing what you post. Improving your Facebook business’ algorithm is when Facebook notices that your fans are looking at what you post. Positively making the algorithm notice your content and making sure your audience has a chance to see it more often – is what happens when your audience starts to take note of what you’re putting out there for them. 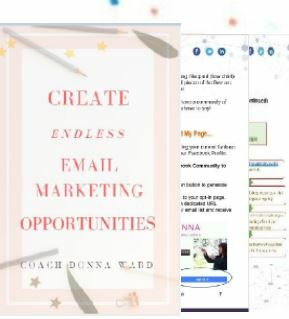 Now you’re talking boosting your possibilities for more people joining your email lists as they start taking notice and you start building relationships. Results come when you engage with your audience and ask them questions on your posts. When your audience starts to interact with your posts, it could lead to more conversations offline. Q: How can we learn Ninja Facebook Tricks from rock stars in your niche? You know who the rock stars are in your niche so use the search bar on Facebook. Find them and model what they’re doing. See which friends of yours have liked your competitor’s page and see what, when, and how often they post. Now you can challenge yourself with similar tactics on your own page! Don’t know who the top people in your industry are? Go ahead and Google a question like – ‘who are the top health sites on Facebook’. Try narrowing that down a bit to your own niche if you need to. You can save those links as ‘Pages to Watch. Q: How do you know what to post? 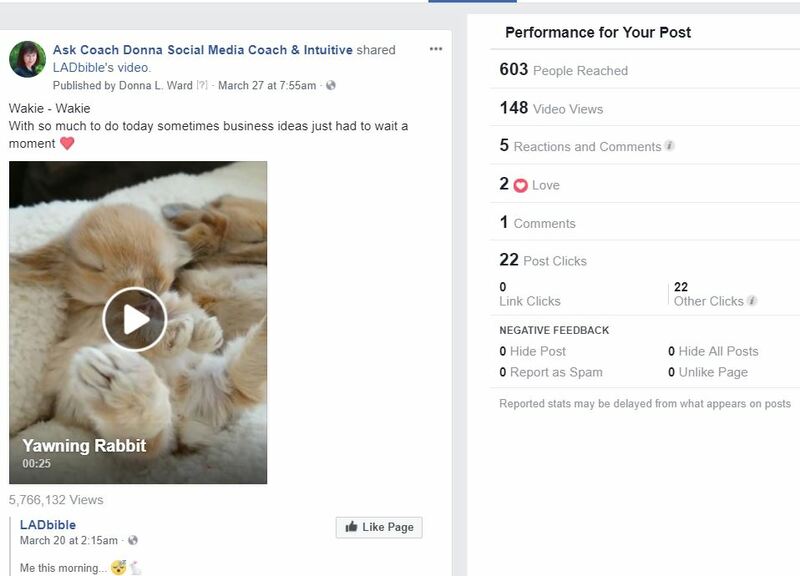 It all does seem to be happening on the insights of your Facebook business page. Make the time to check what posts did the best. Take a look at what time and how much engagement you had along with reach. When you know your audience well, meaning you know what they want content they want to see, then you’ll do better. And a way to know them better is to see what posts they like the best – checking your insights. 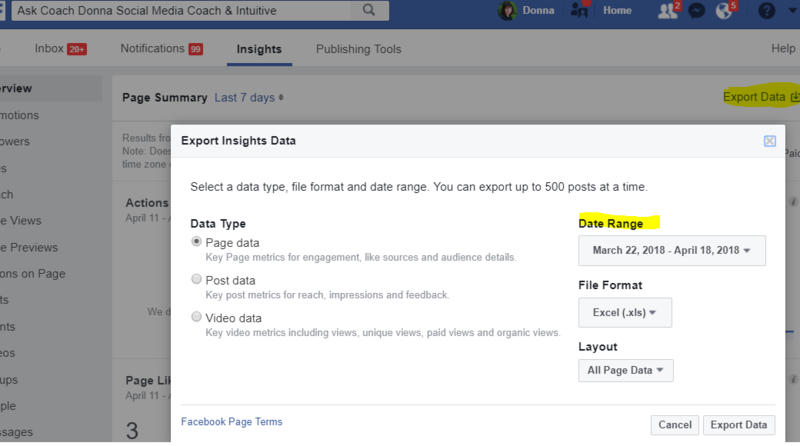 If you want a look at your page, video, or post insights on an Excel Sheet you can do that quickly by going to Your Facebook Business Page Insights > Export > Page Data & Post Data. As Facebook changes and grows, you’ll be changing and growing with them as you make changes in your strategy and tactics to grow. Always offering posts, videos and more content that is valuable and fun for your audience. How can you boost your business with Facebook? It does always go back to knowing your audience and what they like and want that you can offer in a variety of ways. Test your posting frequency – In other words, measure if your posts received better reach/engagement when you posted once a day or three times a day. Once your audience starts seeing your posts on a regular routine, they’ll start to look for it! Rather it’s once a day or four times a day. Even if you’re only producing enough content to post to Facebook once per day, try to stick to that schedule. → Click and learn more from Facebook’s site…WHAT DO YOU WANT TO ACCOMPLISH? There’s a tool for every business goal” per Facebook! https://www.facebook.com/business/overview You might want to take a look at what they’re talking about! How you can use Facebook to ignite your email list! I learned so much from this. I need to connect with my readers and get to know what they want to read so I can increase the viewing. I never thought about the best time to post before so I will pay more attention to this too. Facebook is a mystery to me. Things are constantly changing and Facebook wants you to pay for your stuff to be seen. You have some great info and cannot wait to dig a little deeper. I want to increase my engagement and gain followers. I have been trying to find more ways to capitalize on my income, and many people suggest a Facebook business. I’m still trying to decide if this is right for me. Thank you for this explanation. These are great tips and they really are helpful for I would say those starting out on Facebook and small business owners! I have been playing the Facebook game with my business for over a decade and I still have so much to learn! Everyone could benefit from working their Facebook to it’s best potential! I have always had an organic following which is great but the algorithm on Facebook is forever changing and always confusing. Its wonderful you offer coaching for those who want to up their game! The tips in this post alone are quite helpful and make sense. Ali! Thank you 🙂 And wow you’re doing one of the things I’ve been coaching on for the past 2 or 3 years! I really hate this Facebook algorithm somethings. That we even have to think about ways to get past the insanely LOW amount of engagement we get. I do appreciate your tips and I shall be testing some. I look forward to hearing some great results, Nadalie! Thanks so much for sharing what a lot of people are feeling! Nadalle, we certainly are kept on our toes with Facebook updates! I hope that you find the tips extremely useful – thanks for your comment! I have been majorly working on a lot of this. I have all my friends following, sharing, and liking. I have figured out a good posting schedule now. I have been looking at numbers now. This is a perfect article for bloggers! Great tips. Facebook is such a tricky one since that algorithm is constantly changing. I honestly regret not doing all the things everyone was doing years ago when we all started together because I’m very far behind on growth. But the great news is social media is always evolving so we just have to keep moving forward. It’s a great thing that you’re offering this course. Marketers especially newbies will benefit and learn a lot of new things about Facebook Business. Leveraging on boosted posts that are targeted to the right audiences can bring huge results to any business.